No individual, group or object of any kind on the blue-green marble we call Earth has existence independent from ecosystems, says the philosopher Timothy Morton. Neither is there an abstract, separate entity called “Nature” that is separate from the uglier or more synthetic elements of human life. Understanding this is what Morton calls “ecological thought'. If we don’t feel connected with our soil, oceans, plants, trees and her inhabitants till the smallest micro-level – if we don't feel a part of the system – why would we care? HOW could we care? Why would we make all those decisions to fly less, skip meat or invest in sustainable products? We have to feel connected, and care before we think differently, act differently and protect the things we love. Within a few decades the majority of humans will live in cities, disconnecting in everyday life from environments where other species, plants and trees dominate the area. In this blog I would like to share the amazing story from artist Andy Cato, Groove Armada, who reconnected in their own way with nature. Andy Cato has been part of Groove Armada, one of the world’s most recognised electronic music acts, since the mid 1990s. A duo of Cato and Tom Findlay, Groove Armada have toured extensively all over the world as both a full band and DJ duo, they've charted in the UK top ten with four separate albums – and Andy has also pursued solo projects outside the group throughout his career. In 2011, coinciding with the band taking a break, Andy stumbled upon an article about sustainable farming which resonated deeply. “If you don’t like the system,” it said, “don’t depend on it.” After doing some research he envisioned himself having an organic farm, with healthy soil and nutritious harvests. With no experience of farming, it was a leap in the dark to pursue the dream he had developed in his head and heart. Andy sold his publishing rights and took out an extra mortgage to invest in an area of land in southern France, and started his farm. 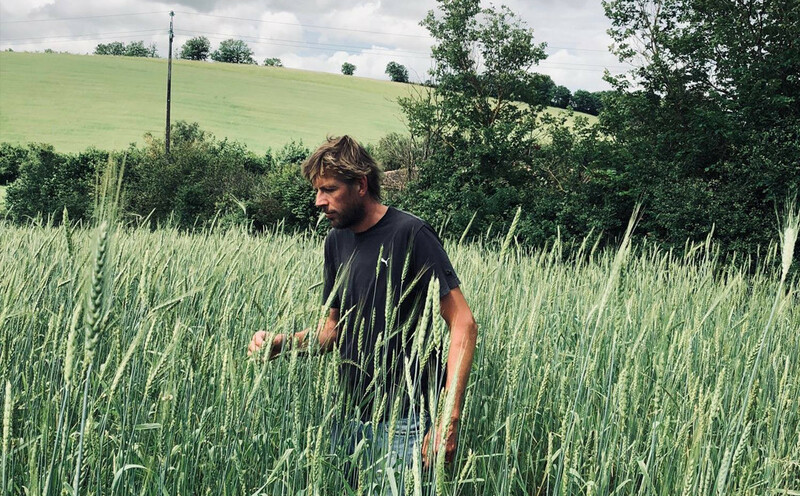 The first years of farming were a path of trial and error, with a fearsomely steep learning curve, but slowly he achieved a nature-inclusive way of farming which balanced giving and taking from the earth. ADE: You reconnected with nature by starting your own farm seven years ago. Can you tell us how this life-changing step has transformed your vision regarding nature? AC: Until I was 35 years old, I’d never planted a bedding plant never mind sown a seed. So the first time I walked down to the greenhouse and saw vegetable seeds that had sprouted, it was a revelation. When, a few weeks later, this became food on the table, it changed my life. Why isn’t this the basis of our education? From the simple wonder of watching seeds turn into tomato plants began a fascination with the processes at work in the soil that allow this miracle to unfold. Then came an understanding of the disaster that is unfolding in the agricultural soils that sustain us. Stories of the soil are linked irrevocably with stories of civilisations. From the moment nomadic tribes settled in an area and began to resow the seeds of their preferred crops, the maintenance of the fertility of the soil became of prime importance. In the end, all civilisations have failed because their agriculture has failed. Today, aware of our failing industrialised agriculture, China is trying to secure its food supply by buying huge tracts of land in Africa. But the Romans did the same thing. As their rural population disappeared into the legions, family farms passed down through generations were bought up by distant landlords cultivating large acreages with the use of slave labour. The result was a rapid pillaging of the fertility of the land. As yields fell, they looked abroad for their food, and for many years cultivated their wheat in what is now the Sahara desert. But the story of our farm is a hopeful one because, given a chance, nature’s powers of recovery are boundless. Once you’ve seen dead soil teem with life again, seeds become food, animals and plants interacting in their spectacular equilibrium, you can’t walk away. A majority of humans will live in cities in the near future. What effect do you think this will have on the human relation with nature? For most of my life I lived in cities. The farm involved a total change in my idea of time. For example, a basic crop rotation might be eight years long. This means that in a given field it will be eight years before the same crop comes round for a second time. Often, the old farming books will tell you that it’s after the second rotation – 16 years! – that the restored fertility really pays off. An eight year cycle means that means I’ve got three times round the block if I’m lucky. Compared to the people who worked on cathedrals that their great great grand children might just get to see, this is a workable timescale, but compared to the 0.0005 seconds you have to wait for the result of a web search, it’s a change. A neighbour yesterday was going off to cut some wood. He described how he was going to do so in a way which thinned the trees leaving space for the remainder to grow. He said this was essential because it meant you could go in for a second cut in as little as 25 years. These timescales impose humility on your grand plans. It’s hard to see how modern city dwellers can maintain this kind of perspective, and the contentment that can come with it. The other day I was repairing a hydraulic circuit and had to call in help from a neighbouring farmer. First of all, they’ll always come, and without looking at their watch. To finish the job, he demonstrated instinctive applied physics of the highest level. But what impressed me most was that each time a difficulty would arise, he would take the time go and get what was needed to solve it. It might be a block of wood a hundred metres away or a spanner that involved driving home. Aside from the fact that it doubtless saves time in the long run, I was struck by his patience and being fully committed to the matter in hand, two things which disappeared with smart phones. In cities, everything is inevitably monetised. When you're farming, or simply trying to live in some kind of balance with the natural world, one of the first things you need to get rid of is the mentality that says ‘how much am I getting paid for what I am doing’. Whilst the farm as a whole needs to work, its success, particularly sustainable success , is based on actions that have no immediate financial benefit. Take hedging. I have a five year plan to re-hedge the farm to increase insect diversity and thus crop resilience. So far I’m about five kilometres down with ten to go. The results may come to fruition in 15 years or so, but its something that desperately needs doing. France, like most countries, has lost vast amount of hedges; two and a half million kilometres over the last 70 years. At the same as digging up all that diversity and habitat, we began applying huge doses of pesticides. It doesn’t require Sherlock [Holmes] to explain the regular reports of disastrous declines in wildlife populations. But the view from the skyscraper makes us feel above rather than part of and dependent on nature. Otherwise these reports would be the only headline news. What would be your solution for people to reconnect with nature? Grow food, even a few leaves on the balcony. There’s a deep rooted, primeval satisfaction about sitting down to a meal you’ve grown yourself. Once you’ve done it, you can’t go back. A life without growing my own food quickly became as impossible to imagine as a life without music. It goes beyond the taste, the simple pleasure of being in the garden or of watching things grow. Like music, it’s an emotional pull. The rituals of food and music, with us since the beginnings of humanity. Your first full-band live tourin over seven years sold out almost instantly. Are you using your power of speech as an artist to inspire and activate your audience regarding the food choices? It’s thanks to the people who’ve bought and listened to our music over the years , and who continue to do so, that I’ve been able to fund the research to get the point of farming on a big enough scale to supply most of the schools, restaurants and some shops in our area, whilst leaving the soil better each year than the last. It’s cost us, as a family, everything financially speaking to get here but we now have a working model which can keep us comfortably and fed and watered, and which is visited by a lot of students young and old and seems to be inspiring others to follow a similar path. It’s through action rather than words that I think we can move things forward. There’s no shortage of people telling us what we should do. There are fewer people doing it. Could you tell us more about your future plans as a farmer and baker? Farming based on observation is endlessly fascinating. But it won’t get subsidies because this kind of farming means you don’t need to buy anything , and agri-business is one of the worlds' biggest businesses , the lobbyists of which outnumber politicians in all the major seats of power. So if there’s going to be a change, it will only come from the field upwards, never from government downwards. Baking wise, we’ve made huge steps towards restoring bread to its rightful place as a superfood at the centre of the table and have lots of ideas to take it further. Do you have any advice, ideas or encouragement to give our readers? Take some seeds, find yourself a corner of the garden or a couple of pots on the windowsill, and start growing some of the things you like to eat and flowers you like to look at. We like to say we have busy lives but on average we spend 35 hours a week looking at screens. Spend some of that time instead finding and visiting local growers. Ask them about how they do things, and if you think they’re taking care in what they do, spend your food money with them instead of at the supermarket. Get together buyers clubs to make it easier to source your food direct. The power has always been and will always be with the people , we just need to be organised and not be distracted or led astray by misinformation in order to use it. More about Andy Cato and his farm? Please check-out The Real Food Fight.